Those of you outside of Ontario may not yet be familiar with YYZ, a new online fashion and luxury magazine based out of Toronto, but let me just say, it is absolutely worth checking out (as is their accompanying blog). I find myself going back again and again to this beautiful editorial, "Colourful Bloom", from their second issue. I am a sucker for millinery of any kind, and the stunning chapeaux, sculptural tulle and ethereal beauty make a mesmerizing story. It is the kind of editorial that makes me wish I had a hard copy instead of an electronic one. These are the kind of editorial photos that I would happily frame and display as artwork on my walls. If your attention is piqued, you can check out the first and second issues of YYZ here. Wow, these pictures are stunning! I've never seen these before, thanks for sharing. Seriously, I need to get myself an eccentric hat! I think It'd be quite the spectacle to walk around with one of these in Ottawa. I love this whole fashion & art concept. Obsessed! Hadn't heard of YYZ, but will obviously HAVE to check them out now! 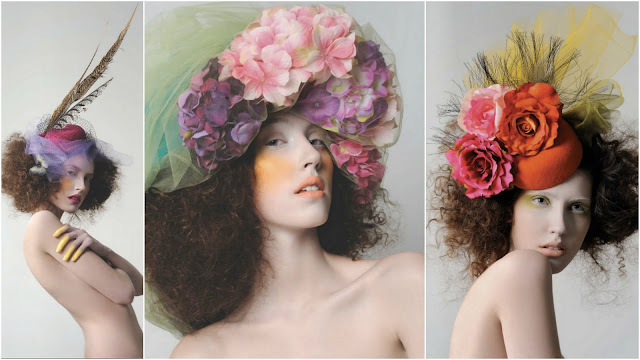 The third image on the top with the orange hat is going on my inspiration board riiiight now! What an amzing editorial !